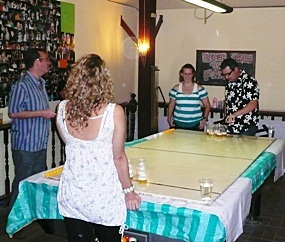 Tusker’s owner Chas Begley introduces customers to the pub’s latest attraction, Beer Pong every Friday night. The Playhouse Entertainment Complex, Chiang Mai, hosted a dinner reception and party for hotels and travel agencies representatives, as well as members of the mass media on March 20. Guests also enjoyed the evening show, with cabaret performance, dance and song. Pictured here, Nopparat Kaewrat, (3rd from left, standing), Sales and Marketing Director, of Playhouse, was on hand with his Playhouse Team to welcome Phitsanu Thepthong, ( 4th left), editor of the Chiang Mai Mail and guests to the dinner party.